Water is the essence of life. Staying hydrated can be a constant struggle because let’s be honest, plain water can be a bit boring. I know that it’s good for you and that dehydration can cause fatigue, headache and make concentrating difficult, a state I find myself in frequently. Detox waters are a great way to hydrate and flush toxins from your body. Adding fruits and herbs to your water can make it that much easier to get or even surpass your daily recommended intake. I’ve been experimenting for awhile with different flavor combinations. I like to prep a quart container right before I go to bed to give the add-ins some time to infuse into the water. 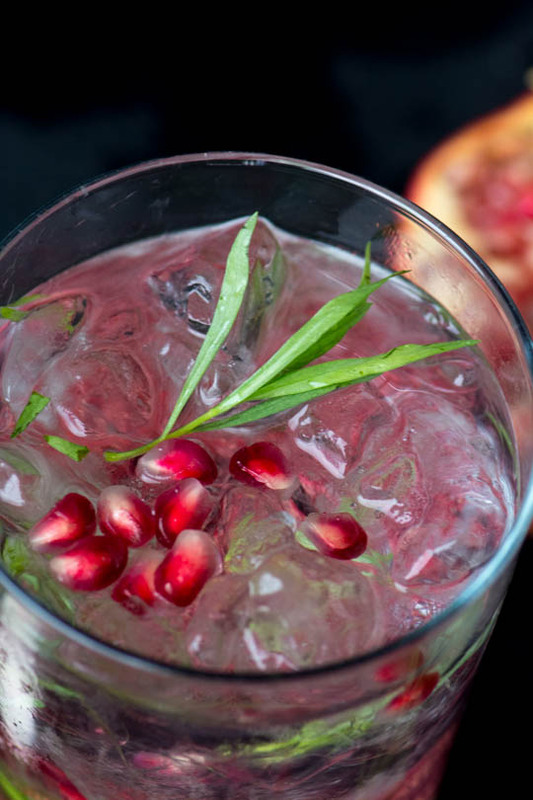 I’ve experimented with lots of different combinations but this pomegranate tarragon combination is my new favorite. 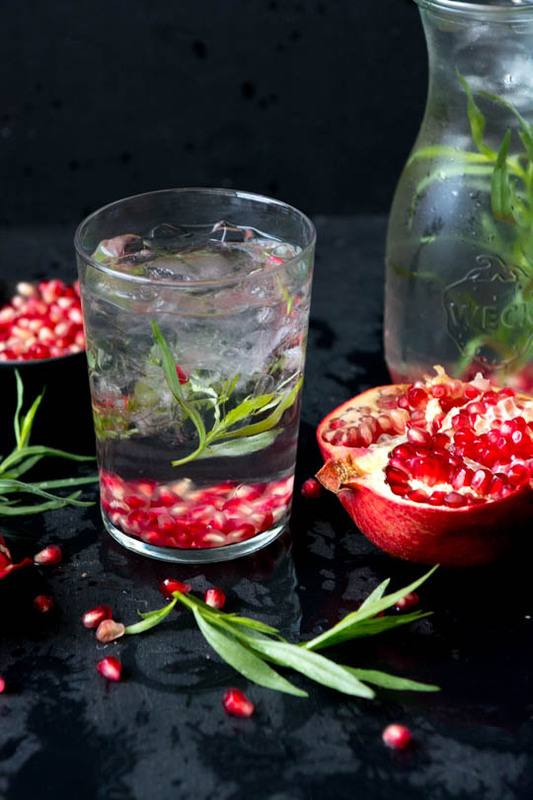 Pomegranates are a great choice to add to you water, they add the perfect hint of sweetness and are loaded with beneficial antioxidants. They are rich source of vitamin C and fiber so they can be effective in curbing hunger. They consist of three times as many antioxidants as both wine or green tea. Pomegranates have been traditionally used for clearing up the skin and reducing inflammation. There are also studies that they can improve heart health, and offer cancer protection. 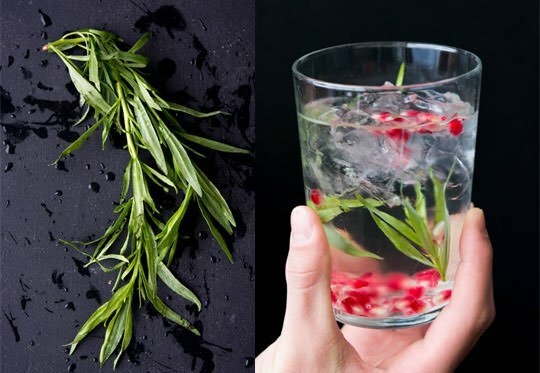 Tarragon is a really under appreciated herb. 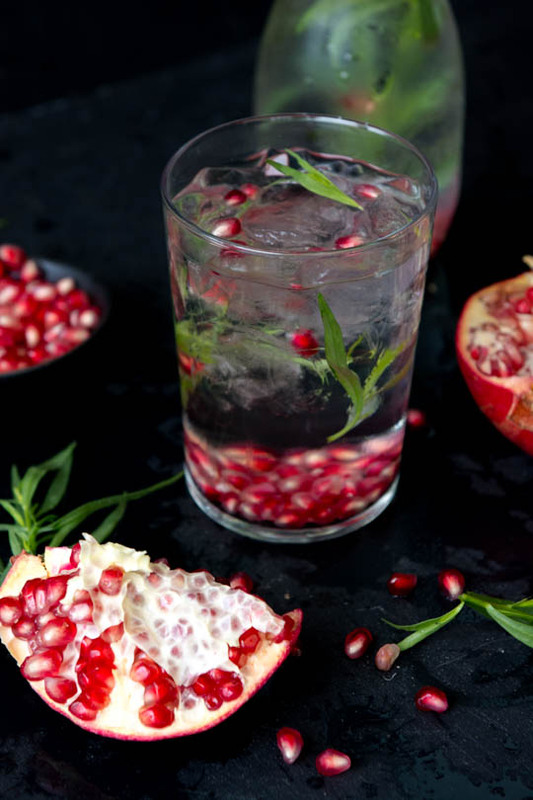 It has a sweet lightly licorice flavor that pairs really nicely with the pomegranates, it also contains vitamin C and has been found to help regulate metabolism and aid digestion as well as act as a natural detoxifier. If you haven’t used it before I highly recommend giving it a try but if you find it isn’t to your liking, mint, rosemary or basil would all make a great addition. 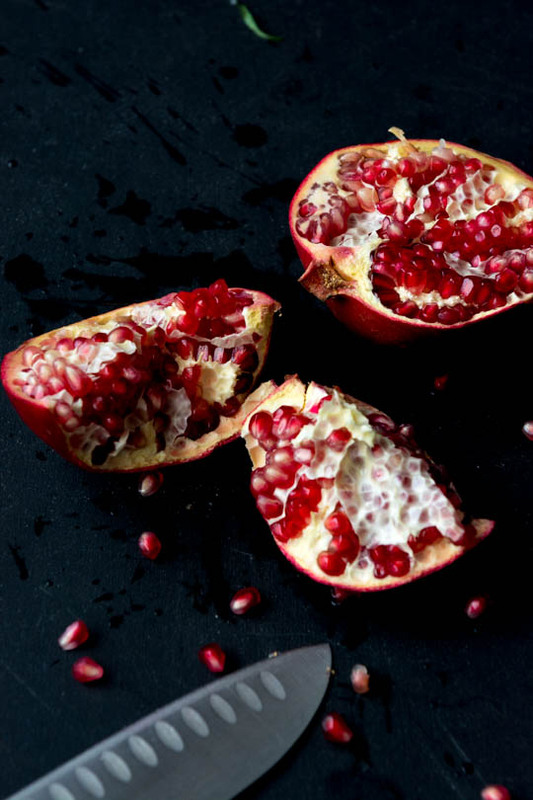 Peeling and removing the seeds from a pomegranate can be a bit tricky but it doesn’t have to be an ordeal. These days you can easily pick up a small container of seeds from Trader Joe’s but it really isn’t that hard to remove them yourself. Here is a great tutorial on how to seed a Pomegranate from Greatist complete with photos! If you do choose to seed an entire pomegranate you’ll have some leftover so you could use them to make this millet pilaf, this coconut panna cotta, , or my personal favorite, these cauliflower fritters. I hope you enjoy this detox water if you try it. I’d love to hear some of your favorite flavored water recipes to add to my collections. If you try it, let me know! Leave a comment, and don’t forget to take a picture and tag it #Scalingback on Instagram so I can see it. This slightly sweet and herbal detox water is an easy way to up your daily water intake. 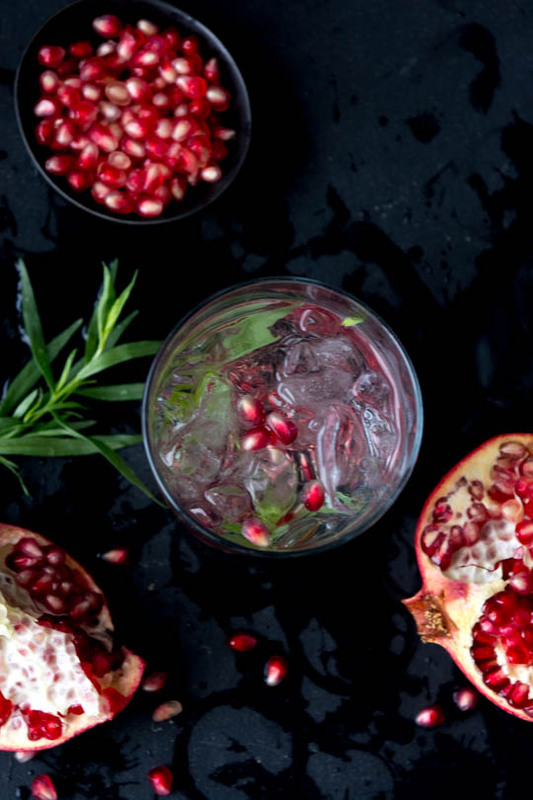 If you start with a whole pomegranate you'll have extra seeds to use for another batch! 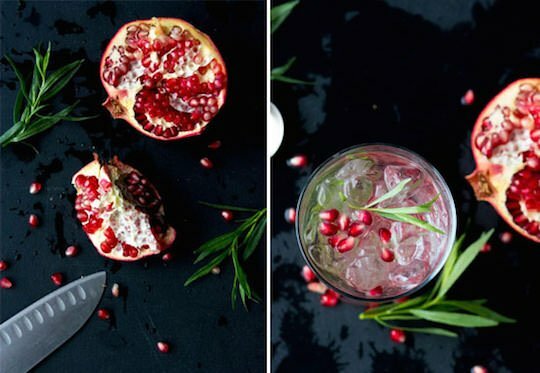 If using a whole pomegranate there is a little trick to removing the seeds that will make the experience much more pleasant. Roll the fruit on a cutting board with the back of your hand to loosen the seeds slightly. Score the top with an x and tear the pomegranate open with your hands. Submerge the pomegranate into a large bowl of water and push the edges down and away to loosen the fruit. Using a large wooden spoon, tap the skin with a wooden spoon to release the rest of the fruit. Remove any of the pith that floats to the top, and drain the water. Measure out ¼ cup of the seeds and save the rest for another use. Place the pomegranate seeds into a small bowl and use the back of a wooden spoon or muddler to lightly smash the seeds and release the juice. Alternatively, if you have a mortar and pestle you can use that to smash the seeds. Add the seeds and tarragon to a large pitcher and fill with the water. Let sit for at least 30 minutes or overnight before drinking.